Laundry symbols on clothes labels are there to help you. Every circle, triangle, and square has a meaning. 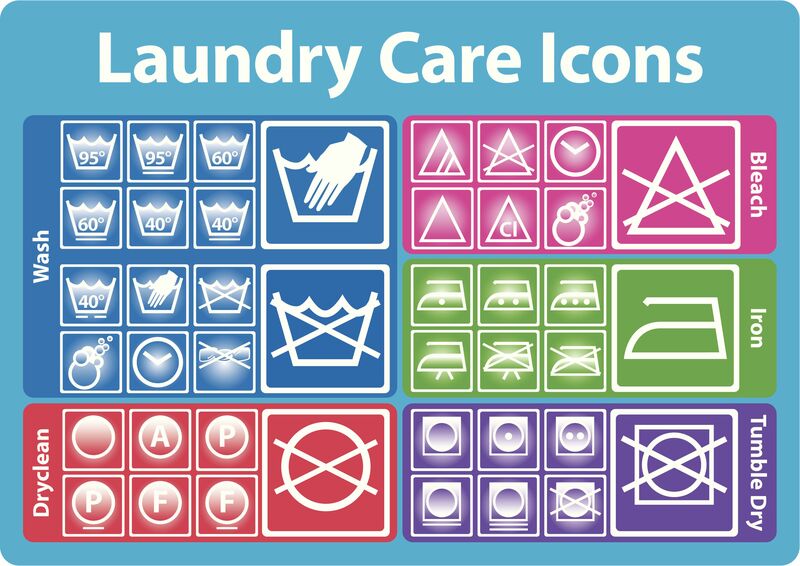 Once you master the five basic symbols, you can become a laundry expert. Do I Have to Follow the Symbols Exactly? You've done laundry for years so you just ignore the labels. Have you ever had a T-shirt shrink so small it fits the dog? Have you ever had a silky blouse come out looking dull and covered with balls of fuzz? Might be time to take a few seconds at look at the care symbols. Most clothing manufacturers recommend the most conservative cleaning method to ensure the best results for the consumer. For instance, some fabrics that are labeled as dry clean can be hand washed. This is why it is important to note the fiber content of the fabric so you can make an informed laundry decision. The laundry symbols on clothing and linen labels provide important information on how to take care of your investment. The labels were developed as part of the International Organization for Standardization (ISO). Symbols, rather than words, were chosen to better convey information around the world. While there are variations in Europe and Asia, the basic shapes transcend continent borders. 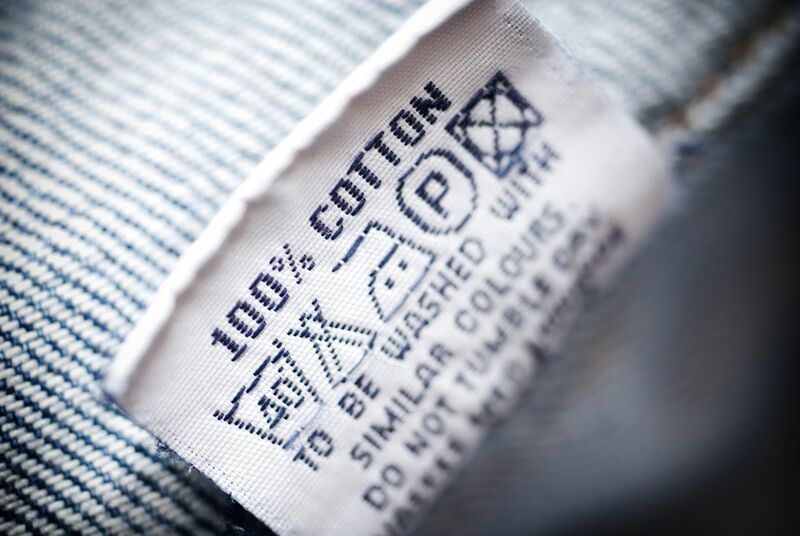 Care labels are mandated by the government in the United States and many countries to identify the fiber content of the fabric and provide care instructions. The international community uses five basic symbols for washing, drying, bleaching, ironing, and dry cleaning. Once you learn the basic shapes, interpreting the rest is pretty simple. One thing to keep in mind: an X through any symbol means "Don't Do This"! The washtub shape tells you how to wash, or not to wash, the garment. In the washtub is a Celsius water temperature or dots to indicate what water temperature you should use: one dot for cold, two dots for warm, and three dots for hot water. The lines under the tub indicate what washing machine cycle to select: one for permanent press, two for gentle. If there is no line, you can use any washing machine cycle. If the washtub has a hand reaching into the water, the garment should be hand washed. A twisted cloth (looks like a piece of hard candy) indicates that you should not wring the fabric. Instead, squeeze gently or wrap in a thick towel to absorb water. Symbols on how to bleach the clothing may not appear on every garment. But when you see the triangular shape, it will offer help on how to select a type of bleach. An X over a solid color triangle means Do Not Bleach at all. A triangle with two slanted lines means use a non-chlorine or oxygen-based bleach. A clear triangle means that any type of bleach can be used on the fabric. Often a label will have no symbol but states "No Chlorine Bleach". If you see this, you can still use an oxygen-based bleach safely (OxiClean, OXO Brite or Nellie's Natural Oxygen Brightener are brand names) on all fabrics except wool, silk, and leather. Excessive drying is one of the most damaging things we do to our laundry. International drying symbols help you select a dryer cycle and a temperature. The square drying symbol also helps you know how to dry clothes naturally or with a tumble dryer. Three vertical lines in the square indicate the clothes should be hung to drip dry rather than placed in the dryer. A curved line in the square means to line dry. Two slanted lines in the corner of the square mean to line dry in the shade away from harsh sunlight. A horizontal line in the center of the square means to dry the garment on a flat surface to prevent stretching. A circle in the square mean tumble dry. The dots will indicate heat levels: one dot for low, two dots for medium, three dots for high heat. The lines under the square indicate the type of cycle to use. No lines means you can use any tumble dry cycle, one line is for the permanent press cycle, and two lines are for the gentle cycle. Look for the iron-shaped symbol to guide you as you select a temperature setting and whether to use a dry iron or steam. Remember, the X means don't do it. An X through the steam coming from the bottom of the iron means use no steam. The dots in the iron indicate temperature. A dry clean only symbol can save you a great deal of heartache and money. There are also very specific dry cleaning symbols addressing cleaning chemicals and the type of cleaning cycle to use that your dry cleaner will understand. Unless you are an expert at clothing care, always believe the dry clean only symbol. If the garment is not expensive and you're willing to take a chance, follow common guidelines to determine whether to dry clean or wash a garment. If you decide to use a home dry cleaning kit, don't worry about the choice of chemicals. The kits use a provided universal stain remover that works for all fabrics.